Please do not buy a lift ticket if you have no experience of using a fast ski tow. You must be confident that you can set off smoothly and ride all the way to the top without falling over. Please do not ‘slalom’ up the tow track. Stay underneath the cable at all times to avoid pulling it off the pylon wheels.If you do fall over let go immediately. At the summit (Pylon 7) please make sure you release your Poma gently and well before the return ‘Bull Wheel’. Failure to use the tow correctly can be dangerous and may cause damage leading to closure. Please don’t break the only ski tow we have at Yad Moss ! Our volunteers reserve the right not to sell you a ticket if they think you may struggle with the tow. Unfortunately we are not able to run the tow at slow speeds for prolonged periods, because of the risk of overheating the motor. Please follow the instructions above and respect the advice of our operators. The North Pennines have some of the highest and most exposed roads in the United Kingdom. 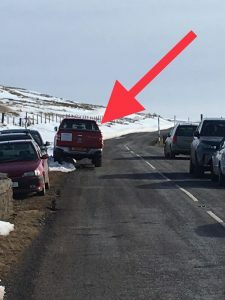 After heavy snowfall access may be difficult, particularly if driving from Teesdale or climbing Hartside Pass. Please be aware that you travel at your own risk. Though not normally essential to reach Yad Moss, we nevertheless recommend fitting winter tyres or carrying snow chains or snow socks. These will significantly improve your vehicle’s traction and braking on snow covered surfaces. The farmer has specified that no dogs are allowed on the site.